Hanoi (VNA) – Vietnam’s top 500 best growth (Fast500) and top 500 best prosperity (BP500) companies 2017 were announced by the Vietnam Report JSC at a ceremony in Hanoi on April 12. 2017 is the seventh consecutive year that Fast500 has been published and the second year for BP500. Addressing the ceremony, Deputy Minister of Planning and Investment Dang Huy Dong lauded the honoured businesses, saying they have greatly contributed to the country’s economic development and prosperity. FAST500 list included Sunhouse Group and Da Nang–Central Region Investment Company, while the Vietnam Military Telecommunications Group and Vinamilk were named in the BP500. 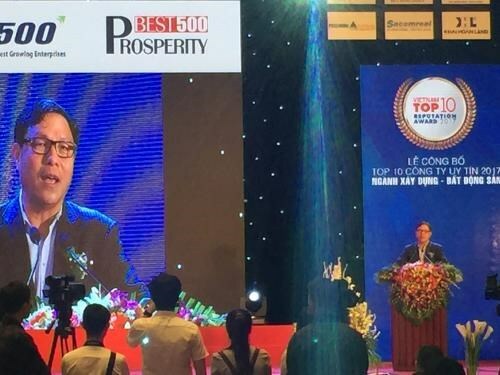 On the occasion, Vietnam Report officially launched the Top 50 Vietnam Best Growth and Prosperity for the first time. improve competitiveness for successful integration and sustainable development. Leading firms in Vietnam are more aware of the importance of corporate social responsibility (CSR) for their growth and prosperity, the report said. Five CSR issues which received significant attention from firms were business transparency, local community aid, unemployment reduction, environmental protection and career orientation for the youth.